a) No one is focused on how we can shorten the planning loop. Defining -What needs to be done, -How it will be done and -Who will be accountable takes too much time. And the processes & endless meetings take over the actual work to be done. b) Companies fail to answer “What’s in for me” for the people involved in executing the strategic projects. In this post, let’s focus more on answering point (b) here – “What’s in for me”. If as a company, you can answer this question for your people-especially those who are involved in executing these strategic initiatives and projects that “how failed execution is going to impact their growth in the company”, half of the battle is won. This is what Infosys, one of the most respected IT services companies in India did recently. Infosys has struggled to keep pace with changing times of IT outsourcing model and recent changes in top leadership have lowered the confidence of all the stakeholders in the company. 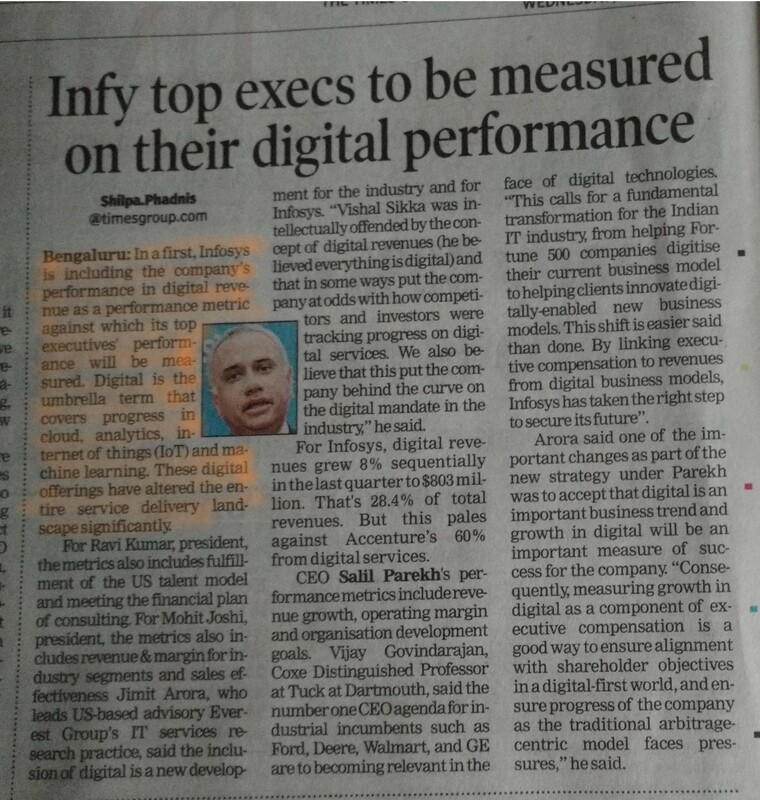 As per a recent article in one of the leading newspapers, now Infosys has linked their leadership performance & bonus directly with the successful execution of companies growth agenda and strategy execution; which is driving revenue from the digital services. Digital services mean providing software services in the area of cloud computing, analytics, IoT, and machine learning. The entire article is worth reading, but the most important line is “measuring growth in digital as a component of executive compensation is a good way to ensure alignment with stakeholder expectations”. If you are not as big as Infosys, but still thinking about applying the same concept of linking your people performance with your strategic project execution, here you get one more validation about your idea. But if the thought is that these big company things are not for your company, think again. Or you probably have tried to apply it in your company, but have failed( in this case, qilo can help you). If your company is also struggling to grow your revenue in your new line of business OR want to introduce a new product/service to market OR want to take your existing product/service to new territories. And your company also fails to go to the next level of growth because your team and department head not taking ownership of your growth agenda with best best strategic planning & execution of projects. If that’s the struggle, then link your team performance & bounces with the execution of your strategic projects. And make sure that this entire performance measurement is data-driven and quantifiable in nature. Another very important point highlighted in the above article that out of 3 business priorities which are assigned to Infosys’s CEO “Revenue”, “Margin” and “Organization Effectiveness & Development”, how many resources & budget have you put in against enhancing your “Organization Effectiveness & Development”. Taking your company from point B to point C needs investment in enhancing your team capabilities, especially when you cannot have access to the talent which Infosys has. Someone if the company should be continuously focused on shortening the planning loop to define WHAT, HOW AND WHO of your strategic growth projects. Linking the part(please note I am saying only part) of your team compensation with the execution of your strategic growth projects will ensure that your people get the message straight. Investing in your “Organization Effectiveness & Development” often takes back seat among other top priorities of driving “Revenue” and “Margins”. But your journey of growth will get unlocked only when you invest your resources in your “Organization Effectiveness & Development” too.